The recent article in the times Teaching Respect to the Faithful about how our religious children act like wild animals at Bar and Bat Mitzvah parties, is a Chilul Hashem and an embarrassment to our educational system. You can't argue with that, unless you buy into the modern day response that everyone hates religious people and that its all about anti-semitism. An even better response by some yeshivas today is to ban Bar Mitzvah celebrations to a limited number of friends, so it won't get out of hand, another brilliant way of dealing with problems, or should I say avoiding the issue. Below is a reprint of an article my father wrote many years back on teaching proper middos and derech eretz. My father used to explain that everything else, like brains and beauty, one really doesn't have much control over, but how one acts and behaves toward others is completely in our hands. Anyone who has been to Camp S'dei Chemed knows how much emphasis my father put on the famous Middos Awards each summer. He also instituted the universal “Kesser Shem Tov Award” that many schools across the US participate in. While some schools do a magnificent job of teaching their students proper manners, others barely touch the subject. We recognize, however, that if we want to correct some of the faults and failures of today’s society, we must begin from the bottom up. Once a tree is fully grown, it is impossible to straighten it out. Only while it’s still young and fresh can it easily be bent into shape. We all complain when we are cut off in line or someone double parks his car in front of ours, or when someone uses improper language, yet we must realize that if we want children and students to be different, we must put as much emphasis on good middos as we do on scholastic achievement. Only then will we meet with success. We must insist that our students display good manners in the way they walk and the way they talk, in the way they dress and the way they act. Being polite and greeting people with a friendly smile, a “Good morning” or a “Please” and “Thank you” doesn't cost a dime, but is worth its weight in gold. Teaching respect for parents, rebbeyim, teachers, and friends is a must. Always choosing others into a game, not insulting others, and being polite are some of the values that must be taught, encouraged, and closely monitored. Let’s also remember that developing good middos is not the exclusive obligation of the school, but must be strongly reinforced in the home. It’s a two-way street! Only when our students see that the home and school have the very same goals will it leave an indelible impression on them. However, when they see inconsistencies, and what they learn in one place is contradicted by the other, then whatever one tries to teach them will be to no avail. If we want to make improvements, then the time to start is now. Children learn far more by what they see than from what they hear. The less they are exposed to outside negative influences the better off they are. We are all too familiar with terrible filth that comes our way through television, radio, Internet, books, and friends. There is no need to elaborate. Exposing a child to any of it puts him at great risk and can negate all that parents, rabbayim work so hard at achieving. This is why the Torah Communications Network has established the special “Kesser Shem Tov Middos Award” in yeshivas and day schools throughout the country. 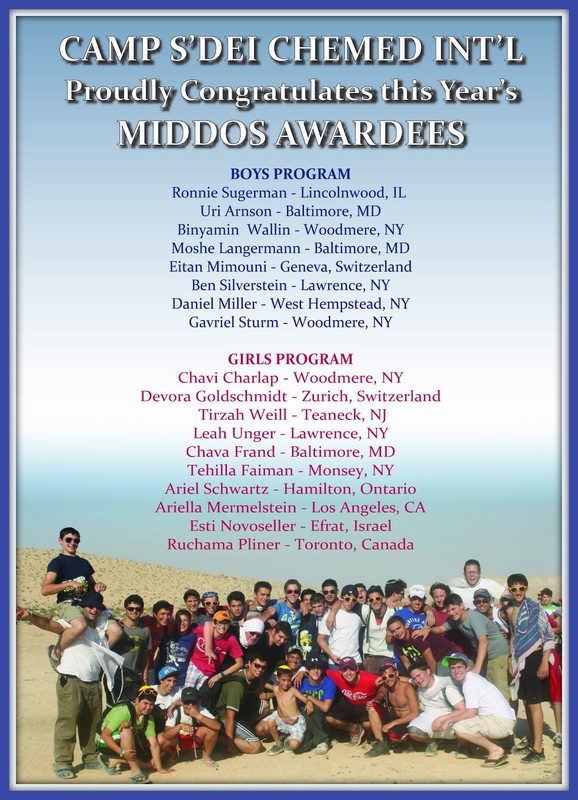 Students exhibiting outstanding middos receive $100, plus a beautiful gold certificate and a sefer. Only when our students see that good middos are recognized and rewarded as much as outstanding scholarship, will they take our message seriously! So nice to read another article of your fathers. keep them coming.